Before we go on, it’s worth noting that while snuck is not universally liked or accepted, most contemporary usage authorities consider it standard, more or less, noting its unmarked occurrence at virtually all levels of English. 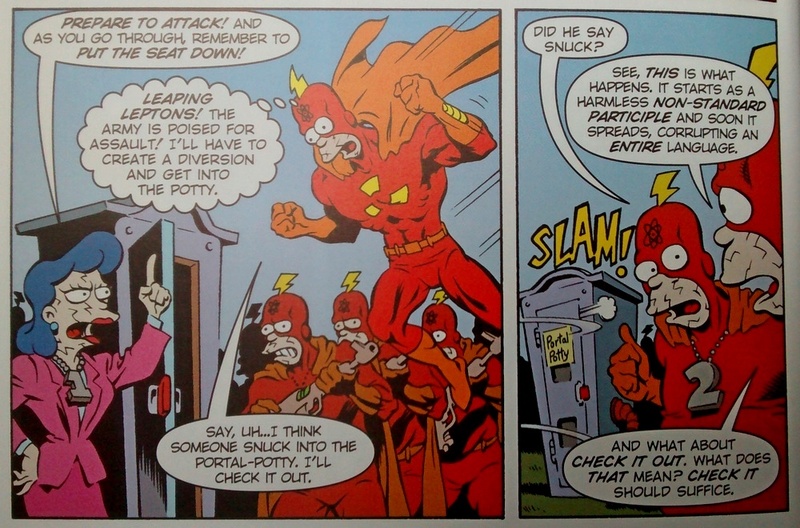 Punched out of the melee – punched right off the planet, in fact – Radioactive Man realises the Strange-O’s are plotting to take over his world, so he disguises himself as one of them by putting concrete on his face and punching it before returning to the scene. Given the story’s tongue-in-cheek nature, I can’t be sure the mix-up was unintentional. But nothing about it suggests irony on that point, and previous form from most people commenting on the passive voice – including language professionals – leads me to suppose it was an unconscious error. Fun story, though. This entry was posted on Friday, March 3rd, 2017 at 4:28 pm and is filed under books, grammar, humour, language, usage, words. You can follow any responses to this entry through the RSS 2.0 feed. You can leave a response, or trackback from your own site. Oh, I think it’s all part of the same cromulent joke on the grammar purists. But it is indeed a fun story. Thanks for bringing it here! I’d be more inclined to give them the benefit of the doubt if they had established their knowledge of the terrain – but there’s more than a whiff of bluffing about it. Good to have another interpretation, though! It was an unexpected treat, Gill. They also are confused about what a past participle is. Yes, and I meant to address this too. It may relate to their uncertainty about the perfect tense in the penultimate frame, or maybe they’re just working from half-remembered ideas instead of looking them up to make sure. 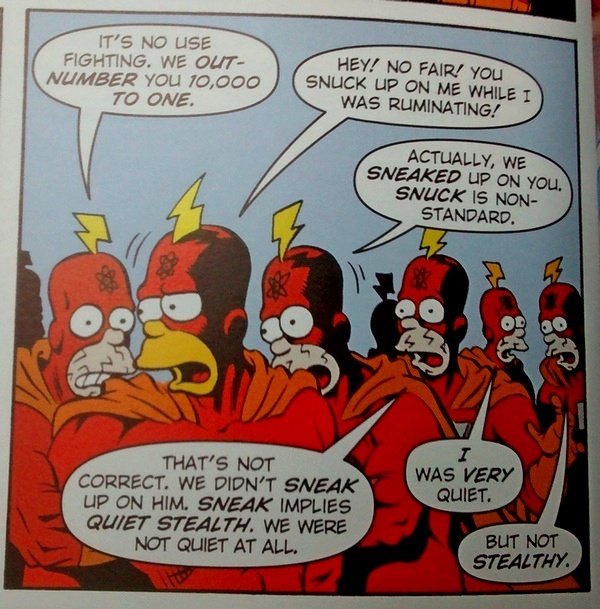 I started wondering how snuck happened in the first place. The answer seems to be be ‘no-one knows’. But I think two dictionary blog discussions go too far – ‘snuck has become the standard variant past tense and past participle of the verb sneak‘ (Dictionary.com) and ‘snuck has become by some estimations the more common past tense form in the US’ (M-W). Google Ngrams shows snuck’ at around half of sneaked and Google searches return 152,000,000 results for sneaked and 11,500,000 for snuck. (With due acknowledgement of the limitations of those research tools.) Also, WordPress’s text editor red-underlines snuck. Gosh I hate typing angle bracket mark-up. In my earlier post about how snuck sneaked into English, I wrote about its mysterious emergence ‘from some uncharted dialectal area’ (quoting Burchfield). Pinker, in Words and Rules, discusses the possibility that it came about through sound symbolism – I’d say that even if this wasn’t its origin, it helped reinforce it; this is also quoted in the earlier post. I don’t think any definitive answers have materialised in the meantime. I left Google Ngrams on the default date of 2000, at which date ‘sneaked’ was comfortably ahead of ‘snuck’. In your earlier post, you include a graph which Emily Brewster sent you, up to 2008, which shows ‘snuck’ really took off in those 8 years. She also searched for ‘sneaked/snuck up on’ and in your tweet you included ‘snuck into’. Some other prepositions just don’t seem to work (as well): ?’The cat snuck through the long grass’. Yes, the gap is closing rapidly: snuck looks likely to overtake sneaked (at least in Google’s Ngram Viewer) within a few years. “The cat snuck through the long grass” works fine for me; if anything, its consonant cluster is easier to produce than that in sneaked through. 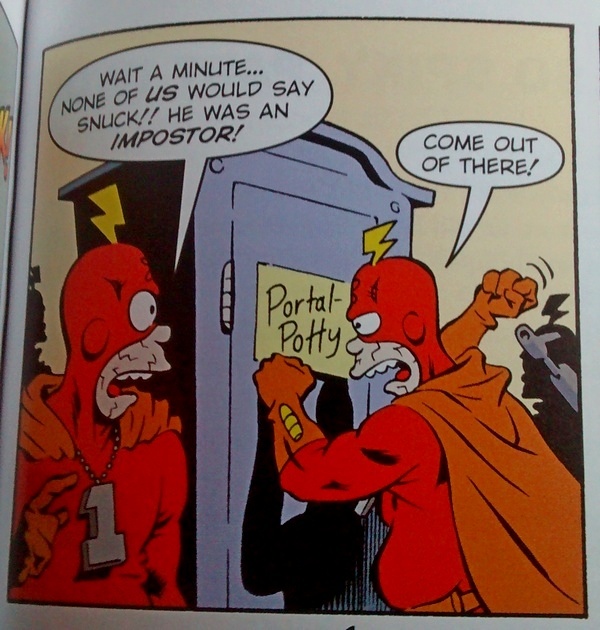 It’s amusing that one of the doppelgängers splits an infinitive in the second last panel (“…to never visit …”). With their attitude, they would probably think that was the sin against the Holy Ghost. Oh yeah! That would have been a more accurate, if no more reasonable, complaint. I love that the Simpsons can actually teach us something–or not teach us something. I suppose it’s all in how you look at it! Great find! Thanks, Kate! 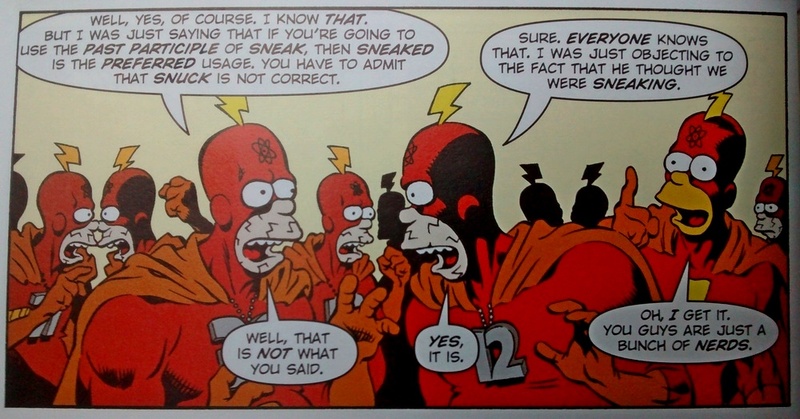 I’ve found The Simpsons extremely educational over the years – though not so much about language, except indirectly.